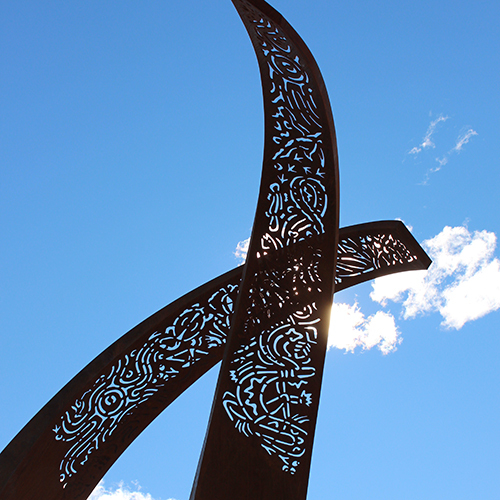 The sculpture consists of two large curved elements, which represent the coming together of the Bega and Brogo rivers and instils a feeling of nurturing and the embracing of cultures. “We are excited to have such a significant piece of public art as the centrepiece to the Gardens, and thrilled to have been able to work with a local artist on this significant project,” Manager of Community Culture and Information, Simon Schweitzer, said. Artist, Jen Mallinson said she drew inspiration from the local area. “The patterns in the top of both pieces represent some of the flora and fauna of this area as well as describing an Aboriginal meeting place significant to Biamanga (Mumbulla) and Gulaga Mountains,” she said. The style of these patterns was inspired by the marks left by the Eucalyptus Long Horned Beetle that is found under the bark of many local gum trees. The sculpture also highlights the boulders (tears of the mountain) that are located on the opposite side of the path, further increasing the significance of the link to country. The sculpture is made from special atmospheric corrosion-resistant steel called Corten. This steel reacts differently to the environment than ordinary steel. It goes through an oxidisation process where fine rust particles bond together to form a protective layer, which preserves the steel inside. During the next few months of this oxidisation process the sculpture will undergo many colour changes from bright gold to orange to dark rust. Other works by Jen Mallinson will be exhibited in the ACT at the Belconnen Arts Centre, running from 14 October to 6 November. Photograph: Jen Mallinson’s The Meeting of Two Rivers at its new home in Bega’s Littleton Gardens.